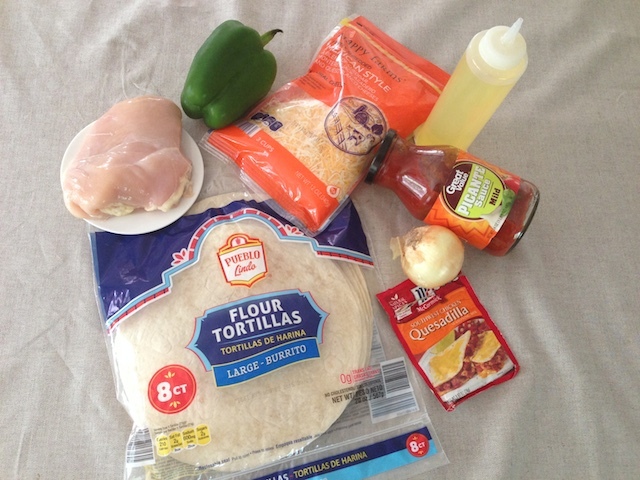 Is it hard to make these Chicken Quesadillas? At times I come to believe that simple recipes can be very tasty. It seems hard to believe that some chain restaurants would actually sit in the kitchen for hours just to make a sauce… I mean don’t get me wrong, I’m sure there are upscale restaurants with chefs who would actually create a wonderful dish but I’m referring to those dishes you can just add a few ingredients and you have a delicious meal in no time. Well, this recipe is just that! With just a handful of ingredients, you can make these delicious and quick quesadillas. No simmering sauce for hours, no baking, just simple and quick. This has become one of our family favorites and hopefully, it may become yours too! Try it! To begin, bring a medium-sized saucepan, halfway full of water to a boil. Lightly salt the water and add the chicken breast; simmer on med-low heat for 20 min, then remove and let sit before slicing. While meat is simmering, slice the peppers lengthwise into thin slices then crosswise. Slice onion into half rings; set aside. Heat a large skillet with 2 tbsp of oil over High heat. Add sliced bell pepper and onions; sear for a few minutes then add 1 tbsp of water (so peppers can get tender quicker). Reduce heat to med-high and add 1 3/4 tbsp of the southwest chicken quesadilla seasoning mix and 1 cup of picante sauce (you can use salsa or pico de gallo sauce instead of picante sauce) to the peppers. Sauté for a few minutes and then add 1/4 cup of water. Simmer until water is slightly incorporated (if you are using a salsa or picante sauce that is on the thinner side you can omit the water). Add thinly sliced cooked chicken breast to the peppers and turn off the stove. To assemble the quesadillas take one large (burrito size) tortilla and add about 2-3 large tbsp of the bell pepper mixture on one end. Top with 1/3 cup of shredded Mexican blend cheese and fold into a half a moon kinda shape. Heat a large skillet over med-low heat and spray with cooking spray. lightly brown each tortilla on each side. You are now ready to slice your quesadillas! Cut each tortilla into 4 wedges and serve with sour cream, lettuce salsa, whatever you like. Enjoy! Is it hard to make these Chicken Quesadillas? At times I come to believe that simple recipes can be very tasty. It seems hard to believe that some chain restaurants would actually sit in the kitchen for hours just to make a sauce... I mean don't get me wrong, I'm sure there are upscale restaurants with chefs who would actually create a wonderful dish but I'm referring to those dishes you can just add a few ingredients and you have a delicious meal in no time. Bring a medium sized saucepan half way full of water to a boil; salt lightly and add chicken breast. Simmer on med-low for 20 min; remove and let rest before slicing thinly. Slice the bell pepper and onion. Heat a large skillet over high heat and add 2 tbsp of oil. Add the bell pepper and onion and sear for a few minutes; then add 1 tbsp of water and reduce heat to med/hi. Add 1 3/4 tbsp of the chicken quesadilla seasoning mix and 1 cup of picante sauce. Sauté for a few minutes and then add 1/4 cup of water and chicken. Continue sautéing until water has slightly incorporated; turn off and set aside. Take 1 flour tortilla and fill with 2-3 tbsp of the bell pepper mixture. Top with 1/3 cup of cheese and fold into a half moon. Cut each tortilla into 4 wedges and serve!